First Impression: This photo shoot was so rushed that he did not have time to completely put on his shirt. Second Impression: Three tiny silhouette heads are competing to see who can get closest to his crotch. 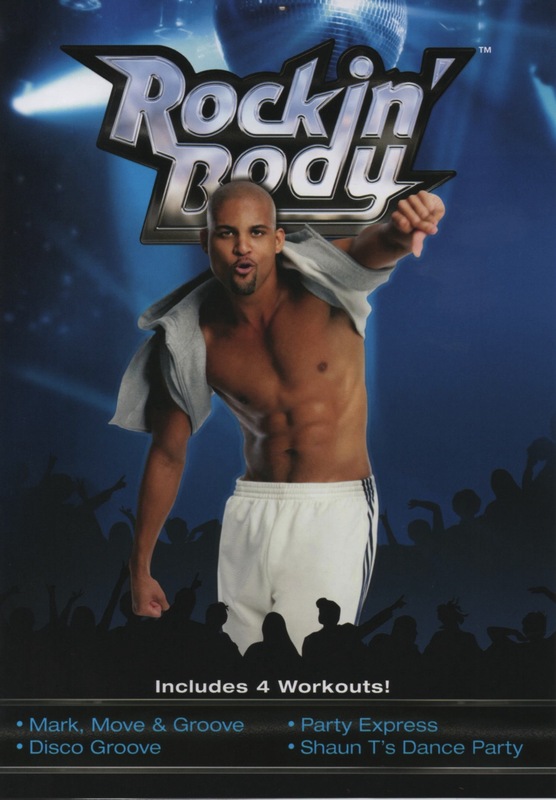 This is another line of exercise DVDs from my TV boyfriend, Shaun T. This time, his dancer friends help demonstrate the moves on a stage, decorated with sections of truss to look like an Equity staged reading of Rent. What surprises me is that there actually is a very large audience watching them do the workout. The DVD opens with a shot of an audience member talking about how he waited in line for three days to get a ticket! Shaun T’s hype man introduces every workout in his British accent, his pumped-up guns bursting out of his shirtsleeves. The usefulness of this person eludes me. Crane shots swing from audience to stage, to prove that the audience actually is there for the whole workout. There are shots of the spectators getting really into it, and doing the arm motions along with Shaun T and his pals. I can’t imagine how you could get them to do that unless they were getting paid. Once, the camera skims the edge of the audience, and catches a glimpse of somebody’s twelve year old son who was obviously dragged there against his will. That kid’s expression is a master class in conveying silent, loathing desperation. Each of the four workouts on the disc is themed and costumed. The Disco Groove one is pretty fabulous – everyone’s in terry cloth rompers, shiny leggings, headbands, and gold bikini tops. Two of the dancers are in matching copper colored bodysuits with a plunging V neck. Only one of these women opted to wear a bra, and I’ll bet you could guess which one looked more comfortable. With all the hubbub, I was worried it would be difficult for Shaun T and I to get a quiet moment to say hi. But then in the middle of the workout, Shaun T looks at the camera and says, “Hey girl! I wanna talk to you for a second. You’re looking good, girl!” Even when he’s working, Shaun T takes time out for the two of us to reconnect. That’s why he’s such an awesome TV boyfriend.